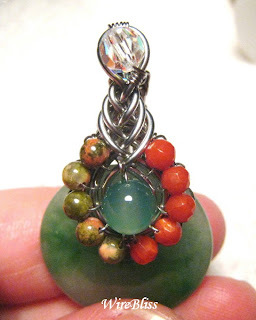 Last night/ early this morning I completed this Donut Jade Pendant incorporating the Pipa technique into this otherwise boring Jade Donut Bead. 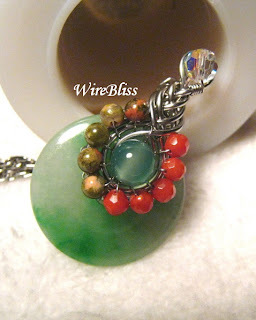 The idea have been swimming around my head for about two weeks while I was wire wrapping the other two donut jade pendants. Somehow I can't figure out how to finish it off, especially on the bail part. So, this piece developed as I was making it and one lead to another and along the way I figured out how to finish off the bail. 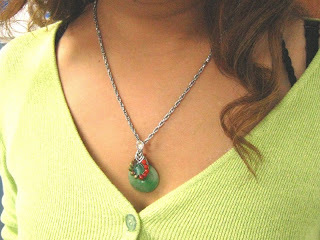 The jade donut measures about 2.3cm at its widest and the length of the pendant is about 3.5cm. The 10 beads surrounding the pipa knot are 4mm unakite and coral beads. There are another 8 of them at the backside of the pendant. I added one 6mm round swarokski crystal (AB) to the top of the pendant to give it a bit of shine/sparks. The Guess the number of rings contest was fun but was over a bit too soon :) The winner is Kathy. Kathy, if you are reading this, please email me with your choice of the ring. Mei, really creative way to incorporate so many things into one.. :) Glad to see PIPA can be transformed to so many designs! Yati there is only one pipa and the whole pipa and the back is made with one piece of wire, excluding the beads wrapping of course. Corra, thanks for introducing this wired Chinese Knot to me. I have some more ideas, just haven't got the time. thank mei! i think i would try it later...nice design.. Thanks Clare. Thank you for stopping by. Mei that's an absolutely lovely pendant! 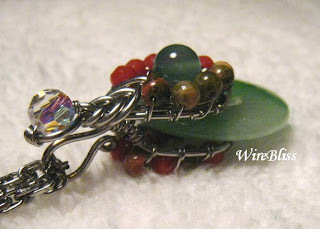 I especially like the way you gradate the red and green stones so the colour gradually comes around. Can't wait to see your pix. You left a message for me on my blog so I thought I should stop by yours. I must say your pieces are absolutely amazing. They make mine look so simple. I thank you for your compliment. I will check in on your page more often maybe get some inspiration from you. While you hope to one day stay home with your children as I do, I hope to one day make so many things as beautiful as you do. thanks you for stopping by "one of the fortunate". May your dreams come true.